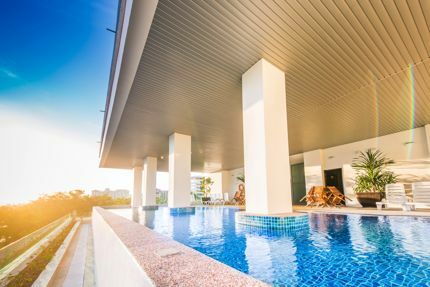 This Muslim (Islamic) friendly 4-star property was opened in 2015 at the heart of Kuah town. The hotel is built in a typical Moroccan architecture. However it welcomes non-Muslim guests as well that constitute about half of their guests. Being Muslim friendly it's a non-alcoholic and no-smoking property. They have further taken a step to create a separate semi-covered indoor swimming pool for women at the second floor where even Muslim women can swim in their swim wears. There are several types of rooms some having views of the Kuah Town while others have wonderful ocean view where you can even see the island Pulau Dayang Bunting about 4kms away. View of the sunset from the ocean-view rooms is wonderful. There is no beach nearby though. All rooms are quite spacious and have standard amenities like air-con, queen size or twin beds, LCD TV, dryers, in-room wifi (although may not work well inside the rooms unless you go down to the lobby), stand-in shower in several types of rooms (suites have bathtubs with showers), bathroom slippers, complimentary toiletries, ironing board, digital safe, tea/coffee maker, complimentary water etc. Superior Rooms have view of the town while Deluxe rooms have view of the ocean (and so do the other higher class rooms & suites). Executive rooms are larger in size. 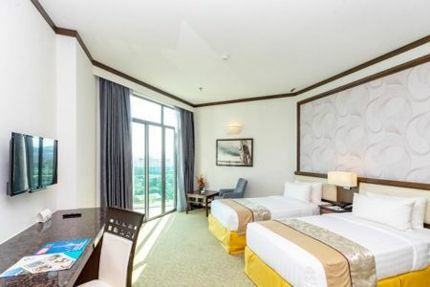 Junior Suites are spacious with a separate living area, the Premier Suites have a separate pantry, and the ultimate Perdana Suite is located on the 12th floor with panoramic view of the sea. Being Muslim friendly the hotel provides Quran and Yaasin, Local Prayer Time Information, Prayer Mat, Qiblat Sign, Ablution pipe at Shower Room etc. The in-house restaurant Jelapang located at the ground floor serves fresh halal food (both local and International cuisine). The restaurant is open 24-hours and you get in-room food through room service 24 hours as well. While the menu covers nice list of gourmet non-vegetarian food, the choices for vegetarian food is quite limited. The best part is the breakfast spread (buffet type).... there are nice variations here and the food is quite good. However here again the vegetarians would struggle finding anything other than bread, milk and fruits. One of the best things to try during breakfast is the freshly baked and hot Croissants.... it's excellent and a must try. No alcohol is served or allowed in the hotel. Although there is a common outdoor pool, the hotel has created a semi-indoor (half roof covered) pool at the second floor keeping in mind the privacy required for the Muslim women to be on swim wears. This female swimming pool overlooks the ocean and the view is wonderful. There is a Gym and also a Spa in the hotel. There is also a souvenir shop at the lobby. They also have a tour desk for local sightseeing and transfer services. Adya Hotel is quite centrally located in Kuah (and that may be the reason the town-facing rooms might get noises from outside). There are several shops and restaurants nearby (within easy walking distance) and even a KFC across the street. The hotek is also quite close to several well known duty free shopping Malls of Kuah like The Parade and Teow Soon Huat which are within 3-5 minute walking distance. Kuah Jetty, Eagle Square are also nearby. Service is friendly although all staff may not speak good in English. Overall a good value for money hotel if you like to stay centrally in Kuah and want to minimize your commute time within the town. However the nearest beach (Pantai Cenang) is about 20 minutes away by taxi. Adya hotel is located about 20-minute drive from the Langkawi airport. No 1 PT, 4001, Persiaran Mutiara 2, Mukim Kuah, 07000 Langkawi.